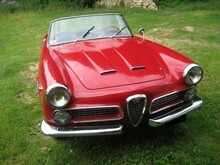 Alfa Romeo introduced two new models in 1958, the 2000 saloon and the new convertible 2000 Spider. The Spider shared its new 1975cc four cylinder engine with its saloon counterpart, although in Spider form it boasted 115bhp against 105bhp from the saloon. 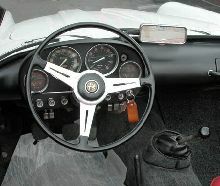 The Spider also used the same five speed manual gearbox as the saloon, but thank fully a floor gearchange was standard. The 2000 Spider had an all new unitary body styled by Touring of Italy. The front end featured the distinctive Alfa grille and headlamps that pointed out from the front wings. Only around 3,500 2000 Spiders were built before production ended in 1961.